MapleCreek Miniature Schnauzer Rescue is dedicated to saving the lives of Miniature Schnauzers who have lost their homes, usually through no fault of their own. Their owners can no longer keep them for any number of reasons including divorce, death in the family, financial hardship, and moving to a nursing home. They also come to us from shelters, off the street, and from puppy mills where they have never known love or felt the security of a home. We are an all-volunteer, donation-sponsored not-for-profit organization, which means that all donations go toward the care of our dogs. Because we are a rescue group, we do not have dogs available all the time, and maintain a waiting list for adoption. Our dogs are carefully matched to adoption applicants. We place our dogs throughout Washington, Oregon and Idaho, and do not ship them for humanitarian reasons. We do all that is necessary to ensure that our dogs are healthy and ready for their new homes. This may include spaying or neutering, worming, shots, teeth cleaning, and other medical services. Donations help defray our costs for these services, as well as our costs for food, grooming, and transportation. Rescued dogs live in foster homes in the greater Vancouver, WA/Portland, OR area until they are placed in permanent homes. An adoption application, telephone interview and home check are required of all persons interested in adopting a dog from our organization. This is both to ensure a good match between the dog and its new owner, and that the new owner can provide a safe, loving and secure home. Our goal is to see that any Miniature Schnauzer coming through our organization is placed in a loving forever home and will never again have to face being on the streets, in a shelter, or any other dangerous situation. Visit the following web pages to learn more about our organization and how we go about helping the dogs we love and protect. Click on the links below, or at the top of any page. 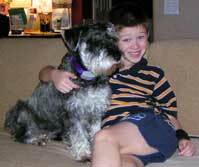 Adopting a Dog: Learn what you need to know if you are considering owning a Miniature Schnauzer, and what steps to take if you are interested in adopting one. Surrendering a Dog: If you own a Miniature Schnauzer that you are no longer able to keep, learn what steps you need to take to surrender it to our rescue organization. How You Can Help: We are always looking for volunteers to help with our rescue efforts, and we are always in need of donations to help cover our expenses. You can help with home foster care, transportation, home visits, or by making a donation. Happy Endings: Enjoy a quick look through our picture album of dogs that have needed to be rescued, and those who have provided them with new homes, great care, and plenty of love. Contacts & Links: This page lists our members and how to contact them, as well as a few links we recommend you check out. 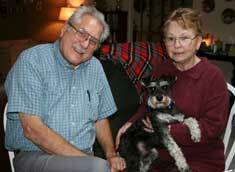 Thank you for helping to see that all Miniature Schnauzers have a safe, loving home.